Last month I promised a column on some interesting findings regarding Twitter and its document-management capabilities. It's been a fascinating exploration, with some very surprising findings. 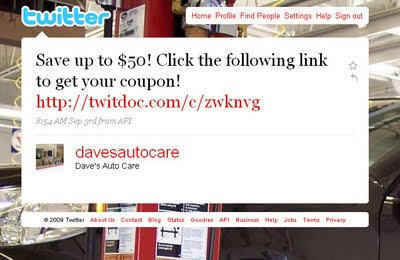 It turns out that “Twitter Document Management,” a seeming oxymoron in itself, is a developing area, with the humble clippable coupon playing a starring role. So to think the fact that the 140-character-limited Twitter, with all its simplicity and even (dare I say it) fad-like characteristics, could play a role in the management of documents, brings a smile (or is that a smirk) to my face. But Twitter has a start…with solutions like TwitDoc coming on the scene to offer document portability and accessibility via Twitter. While not the only Twitter application of its kind, I was attracted to TwitDoc as an easy-to-use solution for attaching documents to tweets, and its tie-in with old friend Scribd (Observer, 5/08) made it an interesting one for me to explore. I might add that I am taking the bold step to include TwitDoc as part of a "document management" solution, as the company's more explicit description of its product is "The EASY way to share your documents on Twitter." I first blogged about TwitDoc in May of this year, and have used it a bit. My typical Twitter mode is sharing links and other tidbits with readers and students, so the occasional TwitDoc application is appropriate. For example, when analyzing tweets on HP's June announcement of the HP Photosmart Premium with TouchSmart Web all-in-one, I was able to compile all the tweets on the topic (sorted by hashtag #hpreveal), put them into a document using PrintYourTwitter.com, (Observer 7/09), and then distribute the document to my Twitter followers using TwitDoc (see screenshot). As my interest in TwitDoc grew, I found they had some excellent coverage already. 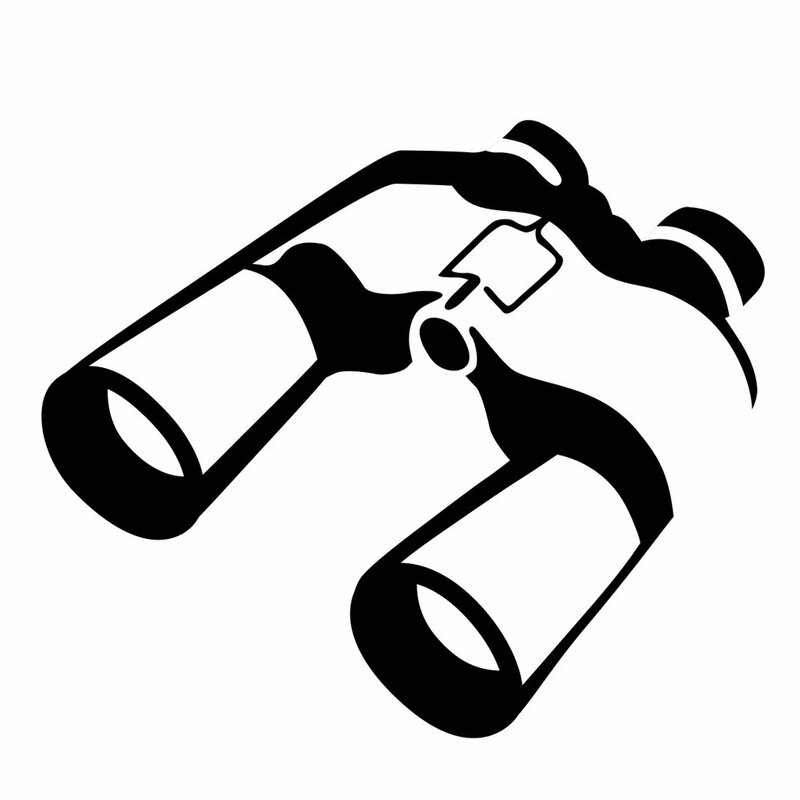 The RockyRadar blog has an excellent profile of TwitDoc (see "TwitDoc Becoming the Source for Document Sharing on Twitter") that covers much of the background I was interested in, but a call to co-founder Bob Brinker answered a few of my additional questions. To those for whom that name sounds familiar, Brinker shares his name with his father, a Broadcasting Hall of Fame member and longtime host of the radio talk show, "Moneytalk." Both junior and senior Brinker have interests in financial publishing as well, with financial newsletters to both their names. The younger Brinker's career in IT, combined with this financial publishing interests, combined to inspire him, along with fellow IT veteran and partner Mike Ormsby, to establish TwitDoc. While using TwitDoc is simplicity itself and easier to use than describe (go ahead give it a try), some of the business aspects of the application were intriguing to me. When asked about revenue models, Brinker replied, "We have an advertising model on viewing docs, and since Twitter is marketing and PR-oriented, we have made it (TwitDoc) freely accessible. As Twitter gains traction, becomes more reliable and more relied upon, TwitDoc will be in [a] position to offer custom branding, as in 'create your own branded viewer'." Alternatively Brinker adds, "[Revenues also may be available] via micropayments for documents. There is currently no real overall leader in micropayments, and even those out in front, like PayPal, are not all that slick. The model is iTunes. We will get there in the Twitter world, I believe, with both advertising and micropayment models." When asked about overall document volumes, Brinker is bullish. "A lot of business documents will continue in Word, Excel, PDF, and it does make sense to distribute them via tools like Twitter." What about the relationship with Scribd? Brinker says, "We were drawn to Scribd, as we didn't want to recreate the viewer. Scribd, with the largest user base out there, and the most developed system. Other competitors require a download-then-view, Scribd doesn't." Additionally he adds, "Scribd has been good to work with. From a publisher's point of view, they're strict on copyright, their publishing engines automatically block copyright." The Hard Copy Observer -- now online! We've commented on these transitions in the past (e.g. see "The New (Online) PC Magazine"), but it's now happened in the Lyra Research family. The Hard Copy Observer is now online! Long in the planning stages, the August 2009 issue will be the last in the traditional (mostly) black-and-white newsletter format, the publication that has delivered the printer industry's news and updates, in detail and with insight available nowhere else, since 1991. Welcome to the Observer Online! All of the news and analysis that you've come to depend on from The Hard Copy Observer is now just a click away. Lyra's new online site provides you with the same in-depth coverage of product announcements and industry events, only now this news is delivered to your desktop—when you want it, how you want it. Bookmark this page now and browse the site each day for the latest industry news as well as in-depth analysis of market trends and vendor strategies. Or click on the news stories displayed in the weekly e-mail that will show up in your mailbox alerting you to new articles and information. 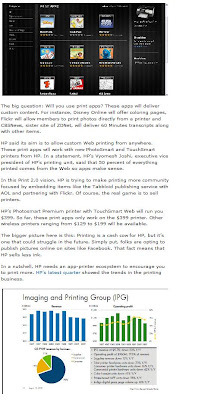 Ed Baig of USAToday has a piece in today's paper (and online) "This HP (NYSE HPQ) printer doesn't need a PC to print stuff from the Web". I found Ed's piece to be quite favorable towards the product we've covered here since its June announcement (see "HP Reveals". It'll take awhile, but as prices fall, I suspect Web printers will become the norm. Lexmark recently hit the market with its own Web-connected all-in-ones, targeted at small businesses. HP's start is promising. The last chapter is yet to be printed. On another HP front, the company today announced the DreamScreen (see "HP's Dandy DreamScreen"), per @harrymccracken at Technologizer, "Photo Frames on Steroids". We've covered the Photo Frame category here, from time to time, more with an eye to their role as a "print substitute" (see "Photo Frames - Printer Friend or Foe?"). So that potential clash still exists, in this case with two products from HP both with enhanced Web access capabilities, and apparently targeted at two different camps customers who want print or want display, but who share the desire for a well-packaged, easy-to-use appliance that circumvents the need for a PC. With HP's news on Tuesday of the official launch of its Web-based printing applications store (see "HP Print Apps store launches"), it seems important to log the first day's action. The above two screen shots show the available apps, and it's interesting to think that after one day, we see 14 apps, most with a high "star" rating, though with only a couple of comments. Wouldn't it be great to go back and see this first day's results from the Apple iPhone apps store? If this post-Labor Day surprise from HP doesn't quite measure up to 2001 and the company's announced intention to acquire Compaq Computer, maybe we can all breathe a little easier. 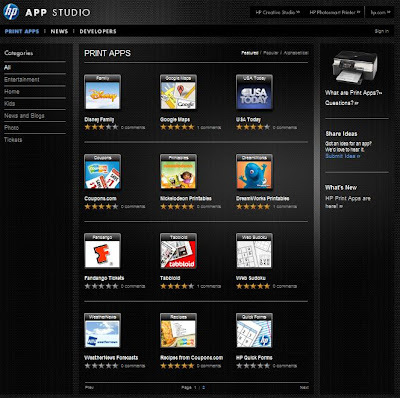 This news is simply the launch of the iPhone-apps-store-like HP Apps Studio, announced in June (see "HP Reveals! Web-enabled inkjet all-in-one sets new industry direction"), along with some new partners, like AOL (!) and CNET. And it's interesting tracking the early response to the news. ZDNet's Larry Dignan, with a video analysis by Sam Diaz, hit pretty hard. In their piece "HP plays the print app game; Will you buy into 'Printing 2.0'? 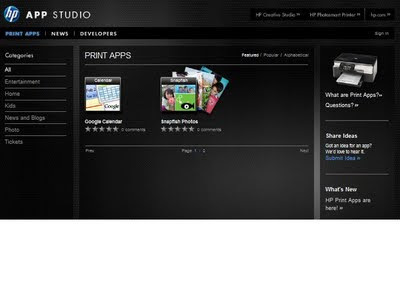 ", the App Studio screen shot is followed by the slide from the Q3 Financials slide set (see "HP Printer Metrics, Q3 FY2009 Results") and questions HP's (and the industry's) need to get back on track with printing in both home and office. And so far, the readers' comments (though not volumes) seem rather lukewarm on the new urge to print that might be brought about by some of HP's recent innovations.